If you've been around The Bivy campground communal area lately, you might be wondering where the "Little Free Library" came from. Turns out, there's quite a story behind this box of stories. SmithRock.com guest blogger Becky Fromm takes us on her nomadic journey that started in March of 2015. Watch her "library in the making video," then read on. Her words and pictures reveal the inspiration behind her donation to Smith Rock State Park. A few years back I bought an old RV while living in Alabama. I didn't have much for plans, but thought it'd be a great home/vehicle so I could continue being a nomad. Shortly thereafter, I somehow ended up moving to Washington State and renting an apartment. My little RV sat lonely for over a year. I knew I'd bring it out to Washington eventually, but from the beginning thought it needed to be some kind of epic journey, not just a "road trip." Earlier that year I had started using the hashtag #spreadhappy (on my Instagram account @thebloomwoods). It just fits with my personality and my constant desire to leave people better than I found them. That summer I ended up working as a cross-country tour guide and met some amazing people who also left smiles wherever they went. The idea grew and grew, and I finally put it into motion. I asked my good friend Parker Jones (who also happens to be a very talented graphic designer- he did our logo!) to join in, and he jumped all over it!!! Then my dear friend Amanda signed up! A cross-country road trip is, first of all, an amazing standalone adventure. Add in doing good deeds, making people smile, lifting others up, promoting and encouraging others to chase their dreams: yes, please!!! We left Alabama almost a year ago today, March 23 and set off west. 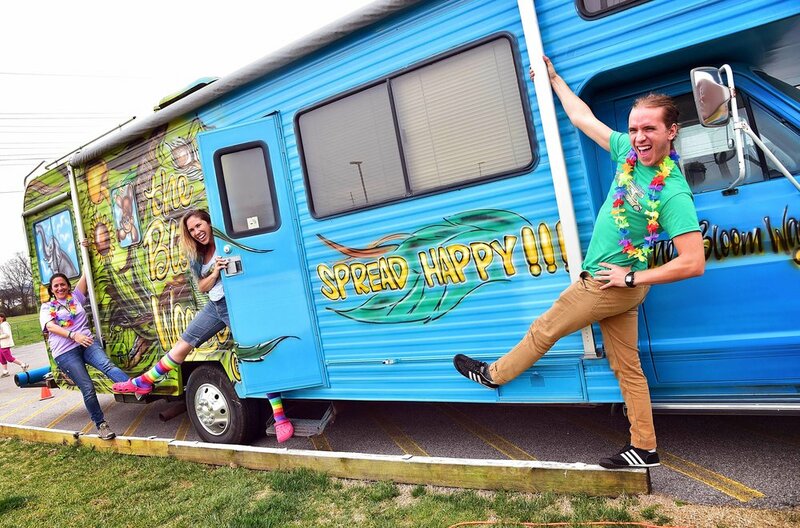 We held 14 'official' events or activities over 6 weeks, but it was nonstop in our fully decked-out RV called the Bloom Wagon! We had quite a few community art projects, homemade postcards, a lemonade stand. We planted trees, we built a tree swing, we passed out a LOT of free hugs :). As we neared the end of our journey, it became important to me that we commemorate the journey with something a bit more permanent than photos. While having lunch with a wonderful #SpreadHappy volunteer in Colorado, Luis Bertolo, I mentioned this desire. He pointed just outside the cafe window where we were sitting... "How about a Little Free Library?" I was hooked!! I'd already known we would be doing our last event in the Bend area because I'm in love with Smith Rock State Park! I did a 14-day rock climbing instructor course there in 2014 and was really impressed with the community feel and honesty system already in place in the "kitchen area" of the Bivy campground. Could we put the library in this gathering site??? I was hopeful, but realistically not entirely optimistic. In a state park? With all the policies and procedures? We had only just over a week to put it all together, but you never know until you try right?? I was absolutely delighted by the entire process. Chris Parkins was my first contact, and he was a dream to work with. We even "coincidentally" ran into each other the day we arrived as he was jogging on his lunch break!! He put me in contact with Park Ranger Matt Davey, who also was very supportive. From day one, everything just fell right into place. It felt like a karmic high-five :). We put out a request for book donations (check out THIS artwork Parker!) around Bend. Tom Beans, the owner of Dudley's Bookshop Cafe, not only allowed us to utilize his cafe as a dropoff but donated 95% of the books!!!!! It took our crew three days to build the library (as an architect by career, it had to be just right!). We had lots of help (and great hospitality) by some super supportive local friends of mine: Katie O'Brien (and Kellen and Erin) and Kelli Carter. The whole thing was perfect. 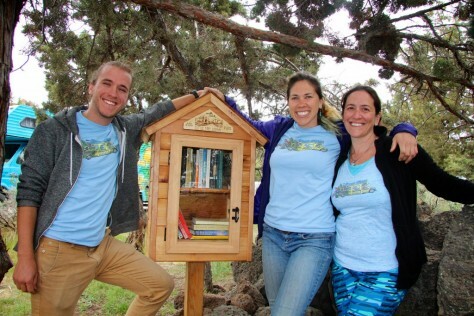 A little Free Library, where one can give and take what they need, was the perfect commemoration of a journey whose primary intent was to Spread Happiness. "We make a living by what we get, we make a life by what we give." I really hope you are enjoying it. P.S. As I sit here now, reflecting back on this amazing journey from a year ago already, I'm rejuvenated to finish the full commemoration! I've got 10+ videos that need to be made, and a website drastically in need of an update. Feel free to check it out (sorry for it's current incomplete state!) at www.thebloomwagon.com. ...and, if you'd like to know more about my personal journey of spreading happiness (which eventually includes the Spread Happy Superheroes!!!!) you can follow along at www.positivityforhire.com! Have a story about Smith Rock to tell?